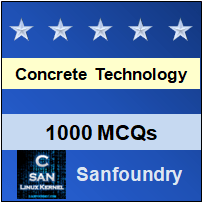 This set of Concrete Technology Multiple Choice Questions & Answers (MCQs) focuses on “Strength and Durability Relationship”. Explanation: Volume chances due to difference in thermal properties of the aggregates and cement paste. Explanation: Strength of concrete is directly proportional to the nature of the loading. Explanation: It is the formula to find the Strength of concrete when we have the volume of cement, aggregates and water. Explanation: 5000 fck2 is the formula of young’s modulus of the concrete according to IS 5456:200. Explanation: Strength of concrete is proportional to Cement water ratio and inversely proportional to w/c ratio. Explanation: As mentioned above that Strength of concrete is inversely proportional to w/c ratio. Explanation: Strength of concrete increase with increase in fineness of the cement. Explanation: After the lab broke the seven-day cylinders, the cylinder from the pier with added water broke at 1980 psi. The other seven-day cylinders were as high as 2620 psi. Explanation: The strength of cylinder with diameter of 15cm and 30cm tall can be approximated as 0.84 of the strength of a 15x15x15 cm cube according to Eurocodes. Explanation: Approximate ratio of direct tensile strength to flexural strength is .5 according to the formula.